Forty-five years ago this week the hottest song in the English-speaking world was an apocalyptic tune that looked forward to a future of warped human life, resource depletion and ultimately a harsh judgement from the almighty. In that final summer of the 1960s, an unknown folk rock duo from Nebraska found themselves the owner of the top spot in the Billboard's Top 40 chart for six weeks. Despite their best efforts, they never charted another song. The song, "In the Year 2525," rocketed to the top of the 45 singles charts in the U.S., Canada, Britain and Australia just as Apollo 11 and its astronauts prepared to blast off for the first landing of humans on the Moon. In my view, the timing of the two events was not a coincidence. Officially known as "In the Year 2525 (Exordium and Terminus)," the song was written in a half hour in 1964 by Rick Evans of Lincoln, Nebraska. Four years later, Evans was in a duo with his friend Denny Zager, who reluctantly agreed to Evans' urgings to record the song. 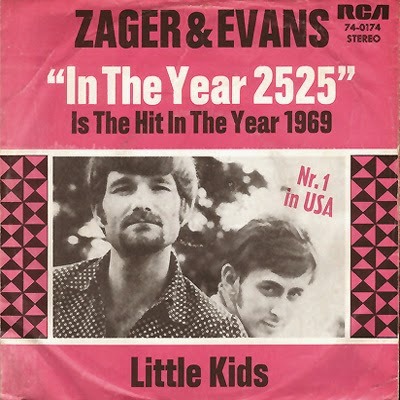 Zager and Evans recorded the song on Truth records in Odessa, Texas, and after the song became a local hit, RCA Records signed the duo and soon the song began its ride to the heights of popularity. Just before Apollo 11 left for the Moon on July 16, 1969, "In the Year 2525" became number one in the United States, and it still held that spot a month later during that other major event of the summer of '69, the Woodstock Music Festival. To me, the song reflected the conflicted feelings many people had about the first landing on the Moon, an event that confronted many people with the future and the hopes and fears it engenders. Although the Moon landing was ultimately seen to be a positive event, many questioned the need to go there. The 1960s was a decade that awoke many controversies over social issues, including civil rights, women's rights, the need for wars such as Vietnam, and questioning of technological progress in the form of the environmental movement. Among the spectators at the Kennedy Space Center as Apollo 11 departed for the Moon was a group of civil rights leaders protesting spending on space travel at a time when so many Americans, particularly African Americans, were living in poverty. For millions of people watching astronauts flying to the Moon, an event torn out of the pages of science fiction, Zager and Evans' song expressed the concerns they felt about the direction humankind was going. For some, it recalled other science fiction tales that they had absorbed from books, pulp magazines and movies. Even before Neil Armstrong and Buzz Aldrin walked on the Moon, Apollo had become a major cultural milestone. That started seven months earlier, when Apollo 8 astronauts circled the Moon and returned home with images of the Earth rising over the lunar surface, which drove home the fragility and isolation of our home planet. The drama of Apollo 11 was heightened by the great danger the astronauts faced by flying so far away from home, something that was forgotten or trivialized in the celebrations that followed the successful completion of the flight. Forty-five years after that historic milestone, historians and others are still debating the meaning of Apollo 11. Many people now argue that Apollo may not have been the great historical turning point that many believed at the time. In an effort to explain why humans have stuck close to home since the last Apollo astronauts returned home in 1972, some people have suggested that Apollo represented a 21st century event that took place prematurely in the middle of the 20th century. That may well be true, but it remains a matter of conjecture. And one reason why humanity stepped back after its first move into the cosmos could be that too many people looked at the future and didn't like what they saw. "In the Year 2525" reflected many people's concerns about where humankind was going. Whether the hopes of Apollo 11 or the fears of "In the Year 2525" represent our future remains a topic of lively argument. In my opinion, Zager and Evans wouldn't have been even a one-hit wonder without Apollo 11. And whether that would have been a good thing - well, that's another matter! When Canada's first satellite, Alouette 1, was launched in 1962, engineers estimated that it would last for a year. Alouette was so advanced that some Americans expected that the satellite would operate for a far shorter time, but in fact it was still going strong ten years later when Canadian officials ended the mission and turned Alouette off. The same fate awaited Alouette 2 after a decade of service, and when Canada's third satellite, ISIS-1, had completed 15 years on orbit, control was turned over to Japanese scientists who continued its research for another five years. From the beginning, Canada has had the enviable problem of what to do with robotic spacecraft that keep operating long beyond their projected lifetimes, an issue which has popped up again with Canada's first astronomy satellite, known as MOST, which has been in orbit since 2003. MOST (the acronym stands for Microvariability and Oscillations of STars) is a low-budget satellite about the size of large suitcase that tracks individual stars for long periods of time to detect minute variations in light levels that reveal what is going on inside the star. Although MOST, which has been nicknamed the Humble Space Telescope, doesn't take pretty pictures like the more famous Hubble Telescope, it has produced solid, important and often surprising science for astronomers. The astronomers who operate MOST, led by Jaymie Matthews of the University of British Columbia, understandably want MOST's mission to continue. Even a low-cost $10 million satellite needs $300,000 a year to operate, and now Matthews is looking for corporate support to keep MOST in operation. Funds from Europe are also being sought to present MOST from being switched off on September 9, and I wouldn't be surprised if the MOST scientists also look into crowd funding. This issue isn't restricted to Canada. In the United States, with its wide open budget battles between NASA, the president of the day, the U.S. Senate and the House of Representatives, threats are often made to prematurely end robot missions. Hubble itself was in danger a decade ago, but in that case, the issue revolved around whether it was safe to send one more space shuttle servicing mission to Hubble before the shuttle program ended in 2011. In the end, NASA relented in the face of public demand, and launched a shuttle servicing mission that extended Hubble's life to the present day. This year NASA has made known a plan to end the mission of the Spitzer Space Telescope in 2015. Spitzer, one of the "Great Observatory" missions that include Hubble, images celestial objects in the infrared and has been flying a limited mission since coolant in its camera ran out in 2009. Now it is under threat of being shut off due to "constrained budget conditions." Even well-known missions, including Mars rovers and the Cassini spacecraft orbiting Saturn, have been threatened with curtailment for budget reasons, although their high profile status has usually saved them. Other ongoing missions have not fared so well. For example, the Apollo Lunar Surface Experiments Packages that were deployed on the Moon by astronauts from Apollos 12, 14, 15, 16 and 17, were switched off on September 30, 1977, for budgetary reasons (Apollo 11's seismometer had lasted only a short time). In the case of MOST, one feels for the great work being done by its scientists, and wonders what might be discovered if MOST were given a longer lease on life. But other Canadian astronomers with other research interests are waiting with varying degrees of patience for funding for their own space-based instruments, which might get the go-ahead for launch and discoveries of their own when the MOST funds are freed up. An even better solution would be for our federal government to spend more on space, but with austerity being the order of the day and the decision being left to a government not known for its enthusiasm for science, that is a distant dream. On a happier note, we are currently watching the resurrection of a spacecraft whose switch was turned off seventeen years ago. ISEE-3 (for International Sun-Earth Explorer) was launched in 1978 into a highly unusual 'halo' orbit around an Earth-Sun Lagrangian point. After its original mission ended, ISEE-3 was repurposed as the International Comet Explorer and became the first spacecraft to encounter a comet, in this case Comet Giacobini-Zinner in 1985. This year a private group of space enthusiasts, including engineers and scientists, many of them former NASA employees, launched a crowd funding effort. More than $150,000 has been raised, and after NASA agreed to the plan and the reboot team dug through archives to determine how to contact and operate the spacecraft, they fired ISEE-3's thrusters last week for the first time since 1997. Still more work needs to be done to make this project a success, but it offers a glimmer of hope to those whose spacecraft has been turned off or faces termination by budget. The Victoria Centre of the Royal Astronomical Society of Canada celebrated its 100th birthday in style last weekend with a highly successful RASC General Assembly that brought RASC members to Victoria from across Canada. General Assembly participants looked back with an excellent panel in the Centre of the Universe at the Dominion Astrophysical Observatory on the life and work of John Stanley Plaskett, who founded the DAO a century ago. Dr. Jim Hesser, who recently retired as DAO director, spoke about how he regularly encountered Plaskett's spirit at the DAO in the form of the high calibre research there that has put DAO astronomers in the front ranks of world astronomy. Other panelists, including Plaskett biographer Peter Broughton, spoke about Plaskett's life and times. The evening also featured a barbecue capped by a birthday cake in the shape of the famous dome enclosing the Plaskett Telescope at the DAO. And Victoria Centre historian Bill Almond marked the completion of his long-awaited history of the Victoria Centre, which is now available for download at the centre's website. The General Assembly included what was called the strongest session of papers presented at a GA in years, starting with a discussion of Mi'kmaw traditional calendar and going on to many other topics, including RASC Archivist Randall Rosenfeld's talk about how Victoria Centre members held a symposium way back in 1931 on life elsewhere in the universe. A highlight of the paper session was 10-year-old Nathan Gray from Nova Scotia talking about the success he and his sister Kathryn have enjoyed discovering supernovas. What about the looking forward? There was a session on Canadian astronomers' 2020 vision for new projects in the coming year. Those include a major update to the Canada-France-Hawaii Telescope, a cloud computing scheme for astronomical data known as CANFAR, and a plan for a Canadian space telescope, CASTOR, along with participation in major international astronomy programs, including the Thirty Meter Telescope, the Serro Chajnantor Atacama Telescope and the Square Kilometre Array radio telescope. On top of the many new programs in work or just coming on stream with Canadian participation, this vision means Canadian astronomers have exciting work ahead as long as they continue to enjoy support from the federal government and the public. The GA was rounded out with well-attended talks by Dr. Laura Ferrarese of the National Research Council on galaxies, Dr. Andy Pon of the University of Leeds on star formation regions, and CBC's Bob McDonald on tourism in space. And finally, the RASC held business meetings that included the installation of a new president, James Edgar of Melville, Saskatchewan. The next RASC General Assembly takes place July 1 to 5 next year in Halifax. I'm already looking forward to it. Historian and writer specializing in the history of space exploration and aeronautics. Author of five books, including The Bomb and America's Missile Age. PhD in the history of technology. Writing a history of the Hubble Space Telescope. President, Royal Astronomical Society of Canada. Editor, Quest: The History of Spaceflight Quarterly.